Choosing the right ceiling panel material for a project makes a huge difference in managing the acoustical response of a room. An acoustical design strategy needs to include an adequate balance of both sound absorbency and sound attenuation. Derived from ASTM C 423, which is the predominant standard for sound absorption in the U.S., noise reduction coefficient or NRC is a scalar representation of the amount of sound energy absorbed by a particular test sample. It is calculated as an arithmetic average to the nearest 0.05 over a limited frequency range (250 Hz, 500 Hz, 1,000 Hz and 2,000 Hz). In a simplification of the concept, an NRC of 0 indicates total reflection, while an NRC of 1.00 indicates total absorption. Ceiling attenuation class or CAC is the measurement of the ceiling’s ability to block sound in a closed space from passing up into the plenum and transmitting back down into a neighboring closed space under the same plenum. The single number for CAC is derived from ASTM E1414. Ceilings with a CAC less than 25 are rated as lower performance, while those with a CAC greater than or equal to 35 are considered higher performance. Fiberglass is more effective at quieting a room than is mineral fiber, as it performs well in both high and low frequencies. Fiberglass is more effective at quieting a room than is mineral fiber, as it performs well in both high and low frequencies. Mineral fiber tends to excel in high frequencies but lose absorption in lower frequencies. Yet, the low density of fiberglass ceiling panels, which makes them extremely resistant to moisture and sagging, at the same time limits their ability to contain sound. Consequently, fiberglass ceiling panels typically have a very high NRC, but a CAC that is on the low end. Mineral fiber ceiling panels are denser and heavier than those made from fiberglass. It is that higher level of density that make them reasonably effective sound attenuators (meaning they impede the transmission of sound from room to room). With good sound attenuation and average sound absorption, mineral fiber ceiling panels tend to have a higher CAC and lower NRC than their fiberglass counterparts. Building and design professionals can maximize acoustic control by combining a sound-absorbing ceiling panel with one that halts the transmission of sound waves; hence the composite ceiling panel. With a composite panel, manufacturers such as CertainTeed laminate a layer of sound- absorbing material [fiberglass]to a layer of sound-attenuating material [mineral fiber]. 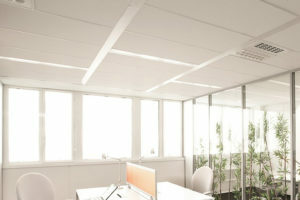 The resulting product is sold and installed as a single ceiling panel. This greatly simplifies operations for the architect and contractor and provides the end user with the best of both worlds in acoustic control for many years to come. Individually, fiberglass and mineral fiber ceiling panels have their own ways of controlling excess noise. However, when used together they produce top-notch acoustical results in a space. Whenever acoustics is a design requirement, allowing fiberglass and mineral fiber to work together in the form of a composite panel is an excellent choice. Have questions on the best ceiling panel material for your project? We can help. Sometimes we have a suggestion you haven’t even thought of. Plus, the evolving science of sound and test it before you build it with CertainTeed’s new sound studio.